Konishi Hirosada (ca 1810 - 1864) Tales of Loyalty, Bravery and Filial Devotion (Chuko Buyu-den): Kataoka Gado II as Matsu Tajima, 1849. Deluxe Chuban. A lovely and delicate print of Kataoka Gado II as Matsu Tajima in the play Keisei Hanabusa Zoshi by the re-inventor of the Osaka woodblock print. The tangled relationship between Hirosada in Osaka and his teacher, Kunisada in Edo is complex. Certainly, Hirosada learnt a huge amount from Kunisada and the highly mannered style of earlier Osaka artists is softened in the gentler and more contemplative pieces by Hirosada who refined the chuban half length portrait into the rich, jewel like okubi-e that he is known for. These large-head-portraits stand up to any kind of scrutiny… they are the crowning achievement of Japanese portraiture and did in their own right influence the direction that Edo woodblock printing took in the middle of the nineteenth century. The influence is clear, not only in production and quality but also in design - look especially at Kunisada’s extraordinary okubi-e of the 1860’s. 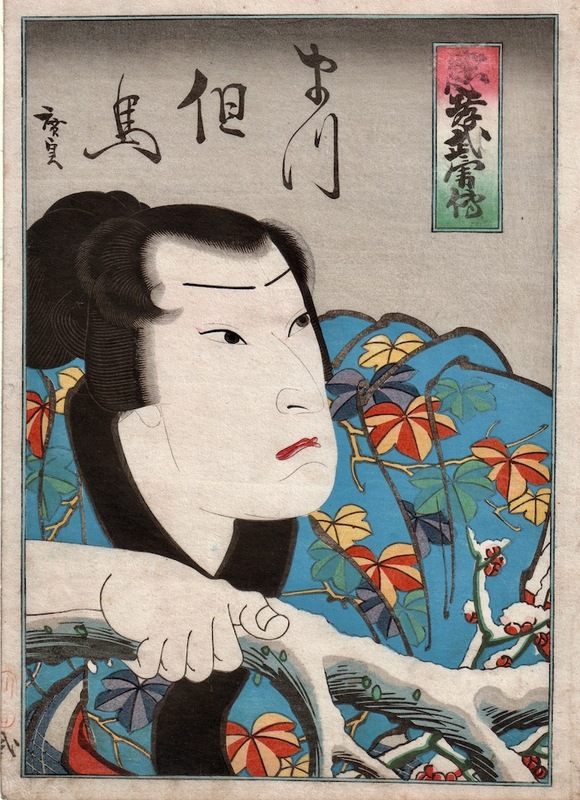 Kunisada denied any influence and pretended to be scornful of Osaka production but the influence is clear. In this very typical Hirosada, a gentle portrait of Kataoka Gado II as Matsu Tajima in the play Keisei Hanabusa Zoshi (the Osaka theatre preferred a gentler approach in its acting), the actor is drawn behind a branch that is covered by recent snowfall. As usual with this artist, the characterisation is delicate and exceptionally economical. The robustness of the branch contrasts nicely with the delicate features of the face in repose. The print is from a series of actor portraits that purport to show the virtues of bravery, loyalty and piety… a common theme that was a blatant attempt to circumvent the stringent restrictions on actor portraits. Colour, impression and condition are all fine. A lovely print.